The photograph is of my grandmother, Henrietta Lelean, my great-uncle, Henry Lelean, and my great-aunt, Minnie Lelean, taken during World War 1. At the commencement of the war, they were all living, together with their parents and younger brother and sister, in the Dwellings. My grandmother worked in munitions. We believe that this was at the National Cartridge and Box Repair Company at Dagenham Dock. Great-uncle Henry (known as Harry) signed up in the Rifle Brigade “for the duration of the war” on 23 November 1914. He was wounded by gun-shot to his left knee, but later made a sufficient recovery to be returned to the front. 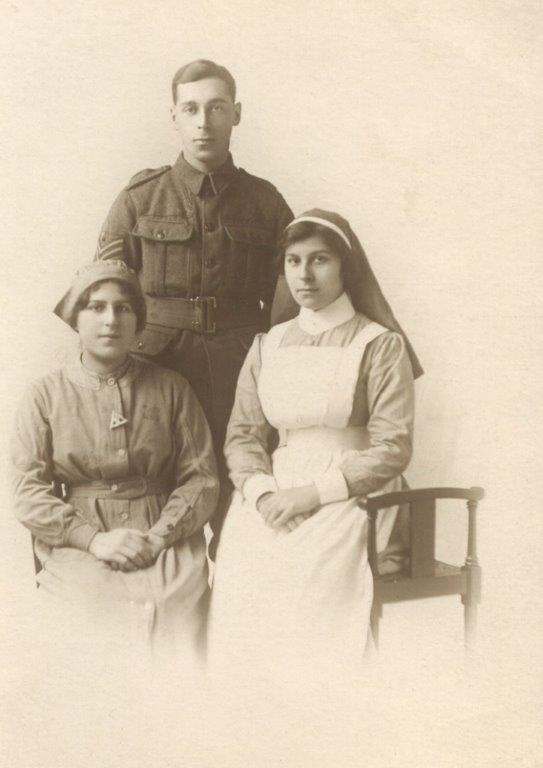 Great-aunt Minnie was a nurse, caring for wounded soldiers – one of whom she later married. We are not sure at which hospital she was based – can anyone tell from the uniform? I think Minnie was my grandmother. She had David – my dad and was married to Walter White. I didn’t know that they met during the war.